The equinox is an astronomical event that marks the first day of autumn in the northern hemisphere and spring in the south. Equinox means equal night and with the sun on the celestial equator, Earth dwellers will experience nearly 12 hours of daylight and 12 hours of darkness. Of course, for those in the south, the days will grow longer as the sun marches higher in the sky as summer approaches. 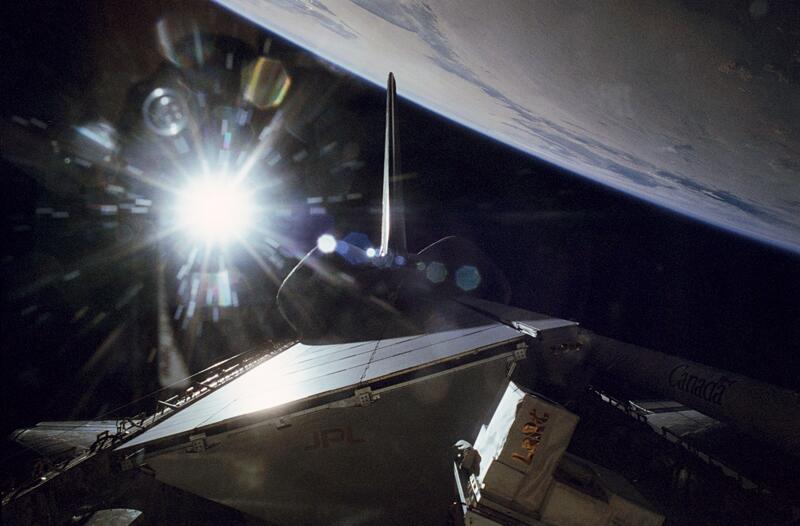 A few weeks after the September Equinox of 1994, the crew of the space shuttle Endeavour recorded this image of the sun poised above the Earth’s limb. 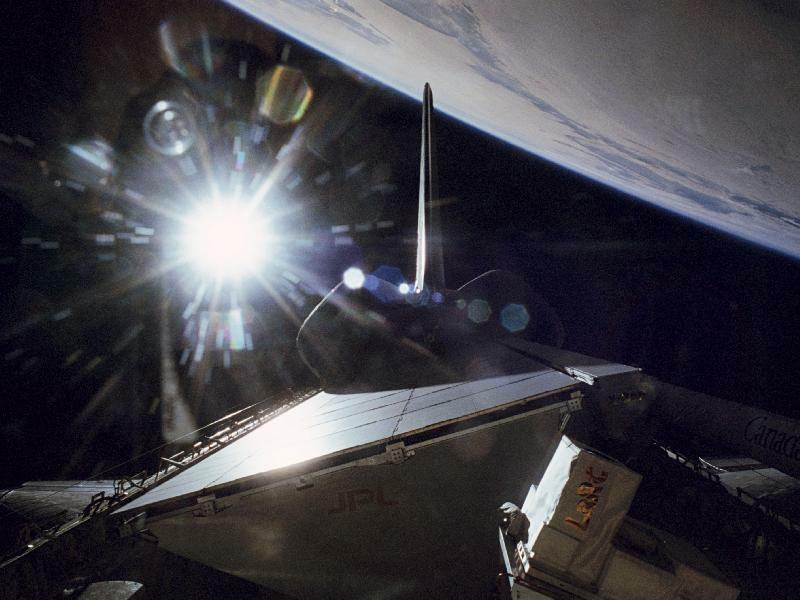 Glare illuminates Endeavour’s vertical tail (pointing toward the Earth) along with radar equipment in the payload bay. Posted by jtintle in Podcasts, Space Fotos, Vidcast. Week Ending Dec. 28 – A Space Shuttle update, resupply of the International Space Station, flight testing of the Stratospheric Observatory for Infrared Astronomy, or SOFIA, Exploration Development Laboratory was dedicated, Global Hawks transferred, photo by NASA photographer Bill Ingalls honored. Explorer 1 — JPL and the Beginnings of the Space Age – JPL designed and built — and, in cooperation with the Army, launched — Explorer 1, the first U.S. satellite and the first spacecraft ever to return scientific data from space. 2007: An Out-of-This-World Year – 2007 was a year of scientific surprises and major milestones for JPL missions studying Earth, our solar system and distant galaxies. SERVIR: NASA lends a hand in Central America – SERVIR’s supercomputer at the Water Center for the Humid Tropics of Latin America and the Caribbean (CATHALAC) in Panama City integrates data from a variety of sources and displays a real-time map of crisis points. Showcase: The X-Planets – These two extreme planets have set the records for the hottest and windiest known worlds anywhere. How to Observe the Quadrantids Meteor Shower – Describes ways to watch the Quadrantids Meteor Shower. Posted by jtintle in Vidcast. Well I am going to try to add this feature every week. So here is a list of vidcast episodes updated this week. New Phenomena on the Sun – Video podcast of the NASA TV broadcast of the event on March 21, 2007. This video shows the latest footage we have captured of the suns magnetic field. What is a Planet? – This is the final version of the “What Is A Planet?” animation which visually describes the definition of a planet as outlined by the IAU ruling in August, 2006. NASA TV’s This Week @NASA, Week Ending Dec. 21 – A review of all the happenings at NASA this Week. Beyond the Light: Dark Matter – The cosmic ocean twinkles and transforms with the birth of stars and their explosive demise into supernovas. How to Observe the Ursids Meteor Shower – A meteor shower occurs when small pieces of comet dust collide with the Earth’s atmosphere. Posted by jtintle in Deep Space. M51, whose name comes from being the 51st entry in Charles Messier’s catalog, is considered to be one of the classic examples of a spiral galaxy. At a distance of about 30 million light years from Earth, it is also one of the brightest spirals in the night sky. A composite image of M51, also known as the Whirlpool Galaxy, shows the majesty of its structure in a dramatic new way through several of NASA’s orbiting observatories. X-ray data from NASA’s Chandra X-ray Observatory reveals point-like sources (purple) that are black holes and neutron stars in binary star systems. Chandra also detects a diffuse glow of hot gas that permeates the space between the stars. Optical data from the Hubble Space Telescope (green) and infrared emission from the Spitzer Space Telescope (red) both highlight long lanes in the spiral arms that consist of stars and gas laced with dust. A view of M51 with the GALEX telescope shows hot, young stars that produce lots of ultraviolet energy (blue). 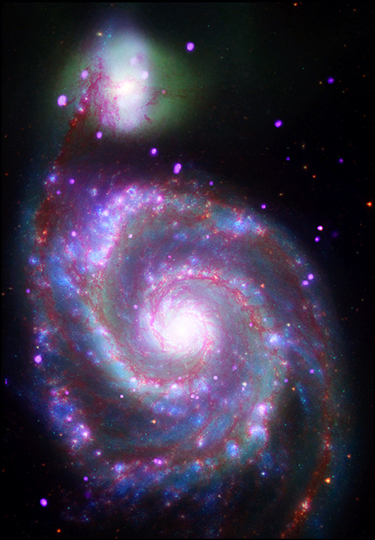 The textbook spiral structure is thought be the result of an interaction M51 is experiencing with its close galactic neighbor, NGC 5195, which is seen just above. Some simulations suggest M51’s sharp spiral shape was partially caused when NGC 5195 passed through its main disk about 500 million years ago. This gravitational tug of war may also have triggered an increased level of star formation in M51. The companion galaxy’s pull would be inducing extra starbirth by compressing gas, jump-starting the process by which stars form.